Quantifying passing skill has been a topic that has gained greater attention over the past 18 months in public analytics circles, with Paul Riley, StatsBomb and Played off the Park regularly publishing insights from their passing models. I talked a little about my own model last season but only published results on how teams disrupted their opponents passing. I thought delving into the nuts and bolts of the model plus reporting some player-centric results would be a good place to start as I plan to write more on passing over the next few months. Firstly, the model quantifies the difficulty of an open-play pass based on its start and end location, as well as whether it was with the foot or head. So for example, relatively short backward passes by a centre back to their goalkeeper are completed close to 100% of the time, whereas medium-range forward passes from out-wide into the centre of the penalty area have pass completion rates of around 20%. The data used for the model is split into training and testing sets to prevent over-fitting. 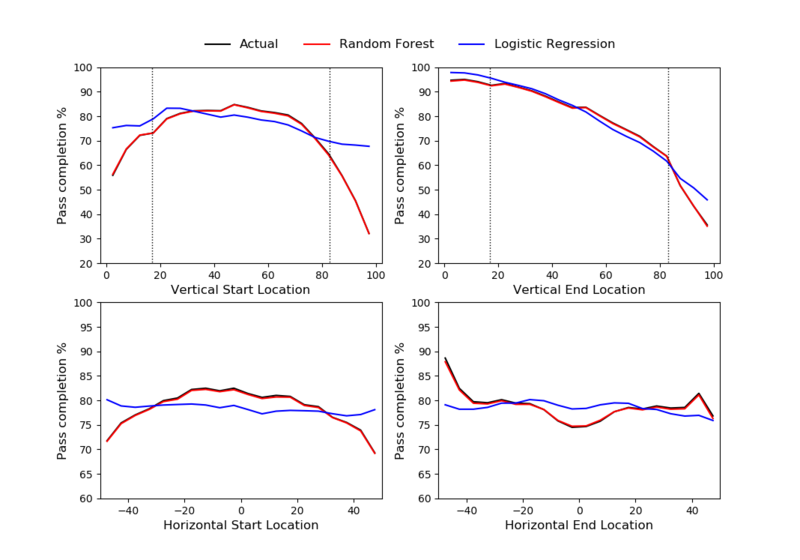 The Random Forest-based model does a pretty good job of representing the different components that drive pass difficulty, some of which are illustrated in the figure below (also see the appendix here for some further diagnostics). Comparison between expected pass completion rates from two different passing models and actual pass completion rates based on the start and end location of an open-play pass. The horizontal dimension is orientated from left-to-right, with zero designating the centre of the pitch. 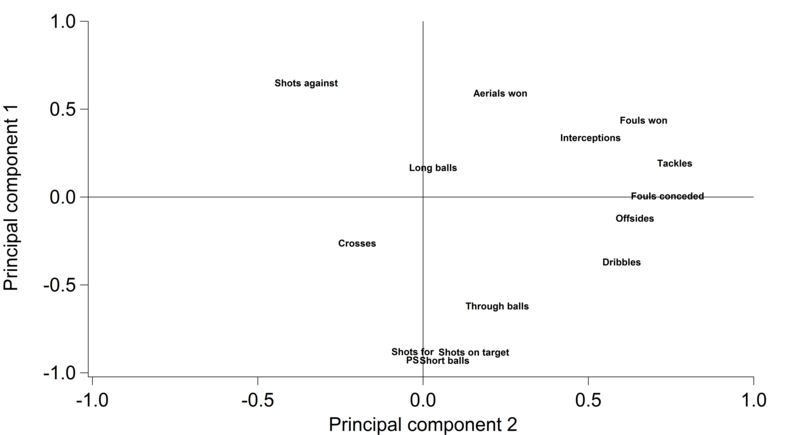 The dashed lines in the vertical dimension plots show the location of the edge of each penalty area. Data via Opta. One slight wrinkle with the model is that it has trouble with very short passes of less than approximately 5 yards due to the way the data is collected; if a player attempts a pass and an opponent in his immediate vicinity blocks it, then the pass is unsuccessful and makes it looks like such passes are really hard, even though the player was actually attempting a much longer pass. Neil Charles reported something similar in his OptaPro Forum presentation in 2017. For the rest of the analysis, such passes are excluded. That gets some of the under-the-hood stuff out of the way, so let’s take a look at ways of quantifying passing ‘skill’. Similar to the concept of expected goals, the passing model provides a numerical likelihood of a given pass being completed by an average player; deviations from this expectation in reality may point to players with greater or less ‘skill’ at passing. The analogous concept from expected goals would be comparing the number of goals scored versus expectation and interpreting this as ‘finishing skill‘ or lack there of. However, when it comes to goal-scoring, such interpretations tend to be very uncertain due to significant sample size issues because shots and goals are relatively infrequent occurrences. This is less of a concern when it comes to passing though, as many players will often attempt more passes in a season than they would take shots in their entire career. Another basic output of such models is an indication of how adventurous a player is in their passing – are they playing lots of simple sideways passes or are they regularly attempting defense-splitting passes? The figure below gives a broad overview of these concepts for out-field players from the top-five leagues (England, France, Germany, Italy and Spain) over the past two seasons. Only passes with the feet are included in the analysis. 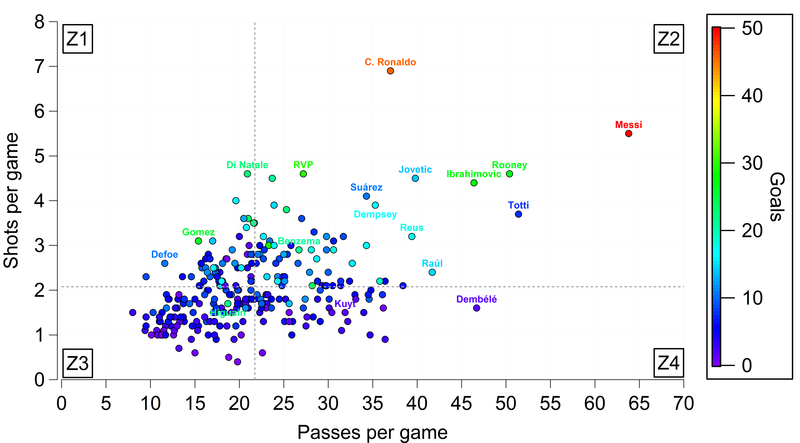 Passing ‘skill’ compared to pass difficulty for outfield players from the past two seasons in the big-five leagues, with each data point representing a player who played more than 3420 minutes (equivalent to 38 matches) over the period. The dashed lines indicate the average values across each position. Foot-passes only. Data from Opta. One of the things that is clear when examining the data is that pulling things apart by position is important as the model misses some contextual factors and player roles obviously vary a huge amount depending on their position. The points in the figure are coloured according to basic position profiles (I could be more nuanced here but I’ll keep it simpler for now), with the dashed lines showing the averages for each position. In terms of pass difficulty, midfielders attempt the easiest passes with an average expected completion of 83.2%. Forwards (81.6%) attempt slightly easier passes than defenders (81.4%), which makes sense to me when compared to midfielders, as the former are often going for tough passes in the final third, while the latter are playing more long passes and crosses. Looking at passing skill is interesting, as it suggest that the average defender is actually more skilled than the average midfielder?!? While the modern game requires defenders to be adept in possession, I’m unconvinced that their passing skills outstrip midfielders. What I suspect is happening is that passes by defenders are being rated as slightly harder than they are in reality due to the model not knowing about defensive pressure, which on average will be less for defenders than midfielders. Forwards are rated worst in terms of passing skill, which is probably again a function of the lack of defensive pressure included as a variable, as well as other skills being more-valued for forwards than passing e.g. goal-scoring, dribbling, aerial-ability. Now we’ve got all that out of the way, here are some lists separated by position. I don’t watch anywhere near as much football as I once did, so really can’t comment on quite a few of these and am open to feedback. Note the differences between the players on these top-ten lists are tiny, so the order is pretty arbitrary and there are lots of other players that the model thinks are great passers who just missed the cut. In terms of how I would frame this, I wouldn’t say ‘Faouzi Ghoulam is the best passer out of defenders in the big-five leagues’. Instead I would go for something along the lines of ‘Faouzi Ghoulam’s passing stands out and he is among the best left-backs according to the model’. The latter is more consistent with how football is talked about in a ‘normal’ environment, while also being a more faithful presentation of the model. Looking at the whole list, there is quite a range of pass difficulty, with full-backs tending to play more difficult passes (passes into the final third, crosses into the penalty area) and the model clearly rates good-crossers like Ghoulam, Baines and Valencia. Obviously that is a very different skill-set to what you would look for in a centre back, so filtering the data more finely is an obvious next step. On to midfielders: I think this looks pretty reasonable with some well-known gifted passers making up the list, although I’m a little dubious about Dembélé and Fernandinho being quite this high up. Iwobi is an interesting one and will keep James Yorke happy. Fàbregas stands-out due to his pass difficulty being well-below average without having a cross-heavy profile – nobody gets near him for the volume of difficult passes he completes. Finally, forwards AKA ‘phew, it thinks Messi is amazing’. Özil is the highest-rated player across the dataset, which is driven by his ability to retain possession and create in the final third. Like Fàbregas above, Messi stands out for the difficulty of the passes he attempts and that he is operating in the congested central and half-spaces in the final third, where mere mortals (and the model) tend to struggle. In terms of surprising names: Alejandro Gomez appears to be very good at crossing, while City’s meep-meep wide forwards being so far up the list makes we wonder about team-effects. Also, I miss Philippe Coutinho. Finally, the answer to what everyone really wants to know is, who is the worst passer? Step-forward Mario Gómez – I guess he made the right call when he pitched his tent in the heart of the penalty area. While this kind of analysis can’t replace detailed video and live scouting for an individual, I think it can provide a lot of value. Traditional methods can’t watch every pass by every player across a league but data like this can. However, there is certaintly a lot of room for improvement and further analysis. Currently there is no information in the model about the type of attacking move that is taking place, which could clearly influence pass difficulty e.g. a pass during a counter-attacking situation or one within a long passing-chain with much slower build-up. Even if you didn’t include such parameters in the model, it would be a nice means of filtering different pass situations. Another element in terms of context is attempting a pass after a dribble, especially given some of the ratings above e.g. Hazard and Dembélé. I can envisage the model somewhat conflates the ability to create space through dribbling and passing skill (although this isn’t necessarily a bad thing depending on what you want to assess). Average difficulty is a bit of a blunt metric and hides a lot of information. Developing this area should be a priority for more detailed analysis as I think building a profile of a player’s passing tendencies would be a powerful tool. You’ll have probably noticed the absence of goalkeepers in the results above. I’ve left them alone for now as the analysis tends to assign very high skill levels to some goalkeepers, especially those attempting lots of long passes. My suspicion is that long balls up-field that are successfully headed by a goalkeeper’s team-mate are receiving a bit too much credit i.e. yes the pass was ‘successful’ but that doesn’t always mean that possession was retained after the initial header. That isn’t necessarily the fault of the goalkeeper, who is generally adhering to the tactics of their team and the match situation but I’m not sure it really reflects what we envisage as passing ‘skill’ when it comes to goalkeepers. Discriminating between passes to feet and aerial balls would be a useful addition to the analysis here. Using minutes as the cut-off for the skill ratings leaves a lot of information on the table. The best and worst passers can be pretty reliably separated after just a few hundred passes e.g. Ruben Loftus-Cheek shows up as an excellent passer after just ~2000 minutes in the Premier League. Being able to quickly assess young players and new signings should be possible. Taking into account the number of passes a player makes should also be used to assess the uncertainty in the ratings. I’ve gone on enough about this, so I’ll finish by saying that any feedback on the analysis and ratings is welcome. To facilitate that, I’ve built a Tableau dashboard that you can mess around with that is available from here and you can find the raw data here. Time to pass and move. Is shooting accuracy maintained from season to season? 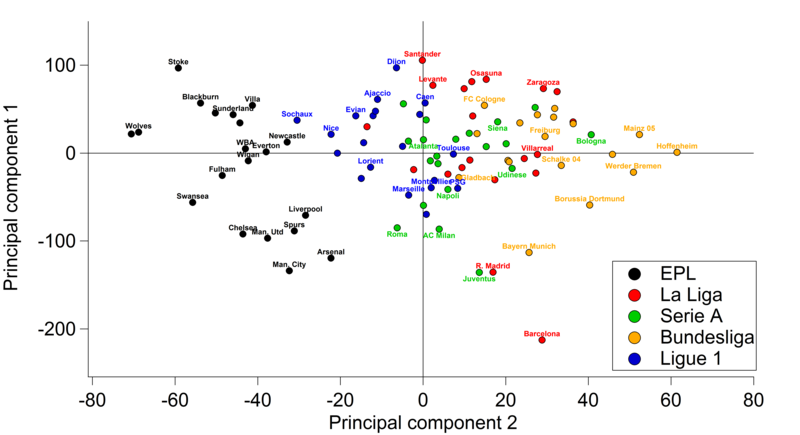 This is a short follow-up to this post using the same dataset. Instead of shot conversion, we’re now looking at shooting accuracy which is defined as the number of shots on target divided by the total number of shots. The short story here is that shooting accuracy regresses more strongly to the mean than shot conversion at the larger shot samples (more than 70 shots) and is very similar below this. Comparison between shooting accuracy for players in year zero and the following season (year one). Click on the image or here for a larger interactive version. Comparison of the level of ‘skill’ and ‘luck’ attributed to shooting accuracy (measured by shots on target divided by all shots) from one season to the next. The data is filtered by the total number of shots a player takes in consecutive seasons. Essentially, there is quite a bit of luck involved with getting shots on target and for large-volume shooters, there is more luck involved in getting accurate shots in than in scoring them. Is scoring ability maintained from season to season? The game’s obsession with centerforwards is not new. After all, it’s the glamour role. Little kids generally dream of being the guy banging in the goals, not the one keeping them out. Does being ‘good’ one year suggest that you’ll be ‘good’ next year? We can all point to examples of forwards shining brightly for a short period during which they plunder a large number of goals, only to then fade away as regression to their (much lower) mean skill level ensues. With this in mind, let’s take a look at some data. I’ve put together data on players over the past two seasons who have scored at least 10 goals during a single season in the top division in either England, Spain, Germany or Italy from WhoScored. Choosing 10 goals is basically arbitrary but I wanted a reasonable number of goals so that calculated conversion rates didn’t oscillate too wildly and 10 seems like a good target for your budding goalscorer. So for example, Gareth Bale is included as he scored 21 in 2012/13 and 9 goals in 2011/12 but Nikica Jelavić isn’t as he didn’t pass 10 league goals in either season. Collecting the data is painful so a line had to be drawn somewhere. I could have based it on shots per game but that is prone to the wild shooting of the likes of Adel Taarabt and you end up with big outliers. If a player was transferred to or from a league within the WhoScored database (so including France), I retained the player for analysis but if they left the ‘Big 5’ then they were booted out. In the end I ended up with 115 players who had scored at least 10 league goals in one of the past two seasons. Only 43 players managed to score 10 league goals in both 2011/12 and 2012/13, with only 6 players not named Lionel Messi or Cristiano Ronaldo able to score 20 or more in both seasons. Below is how they match up when comparing their shot conversion, where their goals are divided by their total shots, across both seasons. The conversion rates are based on all goals and all shots, ideally you would take out penalties but that takes time to collate and I doubt it will make much difference to the conclusions. Comparison between shot conversion rates for players in 2011/12 and 2012/13. Click on the image or here for a larger interactive version. If we look at the whole dataset, we get a very weak relationship between shot conversion in 2013/12 relative to shot conversion in 2011/12. The R^2 here is 0.11, which suggests that shot conversion by an individual player shows 67% regression to the mean from one season to the next. The upshot of this is that shot conversion above or below the mean is around two-thirds due to luck and one-third due to skill. Without filtering the data any further, this would suggest that predicting how a player will convert their chances next season based on the last will be very difficult. A potential issue here is the sample size for the number of shots taken by an individual in a season. Dimitar Berbatov’s conversion rate of 44% in 2011/12 is for only 16 shots; he’s good but not that good. If we filter for the number of shots, we can take out some of the outliers and hopefully retain a representative sample. Up to 50 shots, we’re still seeing a 65% regression to the mean and we’ve reduced our sample to 72 players. It is only when we get up to 70 shots and down to 44 players that we see a close to even split between ‘luck’ and ‘skill’ (54% regression to the mean). The problem here is that we’re in danger of ‘over-fitting’ as we rapidly reduce our sample size. 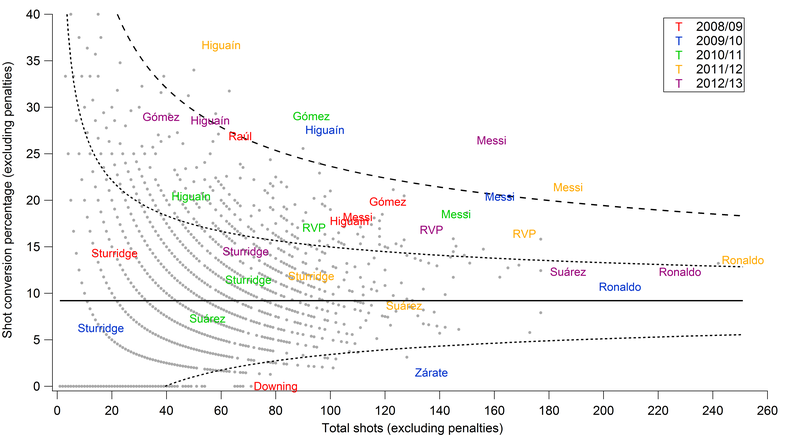 If you are happy with a sample of 18 players, then you need to see around 90 shots per season to able to attribute 80% of shot conversion to ‘skill’. So where does that leave us? Perhaps unsurprisingly, the results here for players are similar to what James Grayson found at the team level, with a 61% regression to the mean from season to season. Mark Taylor found that around 45 shots was where skill overtook luck for assessing goal scoring, so a little lower than what I found above although I suspect this is due to Mark’s work being based on a larger sample over 3 season in the Premier League. The above also points to the ongoing importance of sample size when judging players, although I’d want to do some more work on this before being too definitive. Judgements on around half a season of shots appears rather unwise and is about as good as flipping a coin. Really you want around a season for a fuller judgement and even then you might be a little wary of spending too much cash. For something approaching a guarantee, you want some heavy shooting across two seasons, which allied with a good conversion rate can bring you over 20 league goals in a season. I guess that is why the likes of Van Persie, Falcao, Lewandowski, Cavani and Ibrahimovic go for such hefty transfer fees.